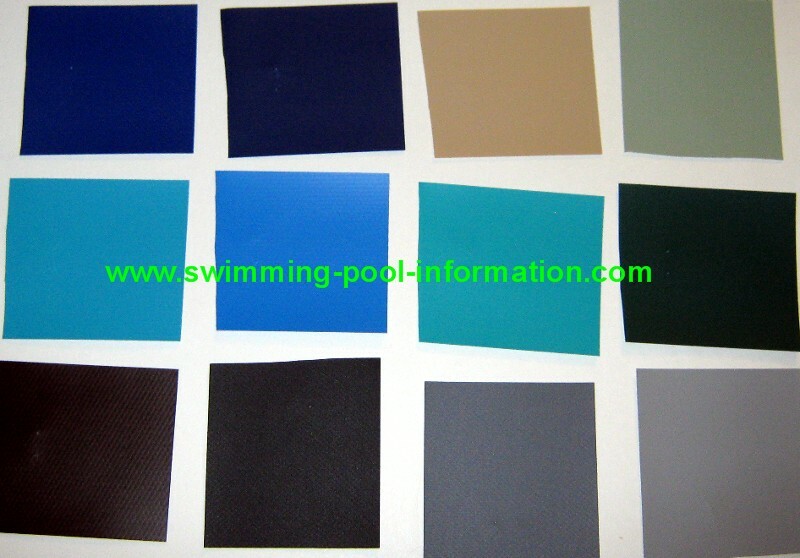 Automatic pool covers are inground swimming pool safety covers. They not only help keep heat in, but they also help keep leaves and debris - and most importantly - children out. The cover is wound up on a reel driven by an electric motor that has a key lock switch to keep unauthorized users from opening cover. Even if your pool is not a rectangular shape, it can still be covered by a pool cover as long as straight tracks can be laid out on the deck. If you have a pool with a raised deck, sometimes a track can be built into side of wall provided the raised wall is straight. Also available are hydraulic drives which offer a longer warranty-there is a photo of this type of drive towards the bottom of this page. If you are interested in a cover like this, contact me with your information for a free estimate. 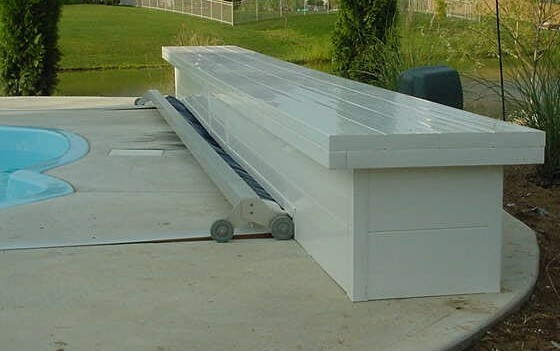 Below the cover is going into the recessed roller area covered by a plate with hinge....pictured down below is a cover with reel system built on top of the deck with an attractive covering/bench seat (probably a better idea if you have an electric motor to keep it dry). These particular motors come with a ten year warranty. A cover can also be installed with roller that is hand turned by a crank. Shown at left is a hydraulic drive for a pool cover. These types of drives are about 30% more expensive than a comparable electric drive pool cover,but offer a 20 year warranty. Also,not having electricity right near the pool water is another safety benefit - also the below ground electrical drives often have problems due to moisture and debris which the hydraulic drives avoid. The company that installs hyraulic drives also gives a 7 year warranty on cover material! Shown below is the color selection of one particular company. These vinyl covers come with a 6 year warranty. 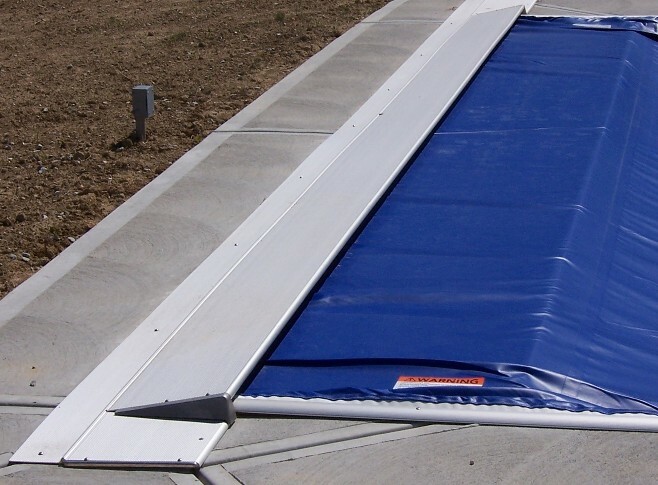 Below is a swimming pool cover pump to pump rain water off the cover. This particular pump has a square base which helps it stay upright on cover and also a built in float switch that turns pump on when the water reaches a certain level. It is manufactured by the Little Giant Pump Company.